Little known fact about homeschool moms is that a good number of us start back to school planning about halfway through the school year. From September on through May, my gears are turning as I consider what is working and what isn’t working. Because sometimes things just aren’t working! Before the school year has even ended I already have the following year completely planned out. Some years I love everything and change nothing. This year we have a lot of changes coming for next year! What goes through my mind as I consider what to toss or keep? What is your family going to have going on during the school year? Anything big going on? A baby on the way, a rambunctious toddler afoot, a big move for your family, husband working a lot of extra hours, building a new home, caring for a loved one or mom dealing with depression or the winter blues? These are just some of the things that could add extra frustration to your school year. So take it easy! Don’t plan a heavy load if your family is already carrying a heavier load that year. We already know those years aren’t forever so save the heavy load for a year you can tackle the extra with a smile. Maybe you are in a season where your family can handle more? If so, plan to get some extra schooling done if that’s what you’re in the mood for. My wise, veteran homeschool Mom once told me not to overbuy curriculum because then you will have to use it. In other words if you buy it you will feel obligated to use something you probably didn’t need in the first place. Now I think of her wise words whenever I am about to buy something that isn’t part of our core curriculum. Thinking that way has already saved us loads of money and lots of precious real estate on the bookshelf. We always talk about our kids learning styles and how important it is, which it is, however so is Moms level of interest in what we are teaching. If you aren’t excited about your curriculum your littles will know it for sure! How can we expect them to love learning if we are thoroughly bored with it? I am a strange, nerdy mom and get giddy with excitement over our history curriculum. Occasionally I notice my own kids making faces of embarrassment at my own love of learning but I don’t care because, frankly I am too busy enjoying it. The excitement level I have over starting American History next year is through the roof. Math on the other hand I will never be ecstatic about, but I can fake loving a few subjects a day if I have something fun to look forward to. In order to keep the homeschool mom burnout from setting in don’t forget to choose curriculum you will love and enjoy the subjects you love to teach. Your kids will be able to tell a difference! We are the ones setting the example here so if we want them to love learning we need to show it. Depending on how many littles you are teaching and how old they are will absolutely determine what curriculum will work best for your family. Do you have a class full of dependent or independent learners? Can siblings close in age be grouped together for subjects? In my case this year, I had 3 dependent learners and a toddler. Things were a touch on the crazy side, so I planned accordingly and kept things simple. I combined two of my littles for everything except Math and Reading, which was a huge time saver and a lot more fun for them! Think about what you want to accomplish with each child during that school year. This year I wanted my oldest to go from being a dependent to independent learner as she is about to enter 3rd grade next year. Primarily I wanted to see her take her desire to learn into her own hands. This wasn’t a process to be rushed especially since she is my child who cares the least about learning, it actually did take the entire year just as I expected! If you don’t sit down and really think about the goals you have for each child, another school year will fly by. The temptation is to think that when our school year is going well, that it must be too easy. At that point the worst thing you can do is change it. So just don’t! Consider yourself blessed and carry all that’s working right over into the next year. If you need a boost of confidence ask your kids how they feel about how things are going? What is their favorite subject? What do they dread the most? I love occasionally asking my kids these questions because usually their answers give me a lot of insight. It doesn’t mean they get a vote, it just means they get a voice and usually a pretty good indicator for the atmosphere of our homeschool. Before you know what the following year holds, God already knows what you’re going to be up against! Any challenges ahead you are unaware of, God has got on His radar already. So pray about everything you are considering and God will direct your paths. This year we felt like God is leading us to take a more creation based approach to our teaching, so next year we are using a new science curriculum and are planning to start teaching our kids apologetics. The greatest part of this is that if you feel God leading you in your homeschool it will equip you with strength when times are hard, grace when you or your kids fail, peace when you feel concerned about one of your kids and comfort when you feel alone in it all. God didn’t call us to this lifestyle only to leave us alone in it. We always say that no one will love our kids more than us Mamas will but the truth is that God loves them even more than we do! And last I checked we are all God’s children. Purge what is dragging you down. 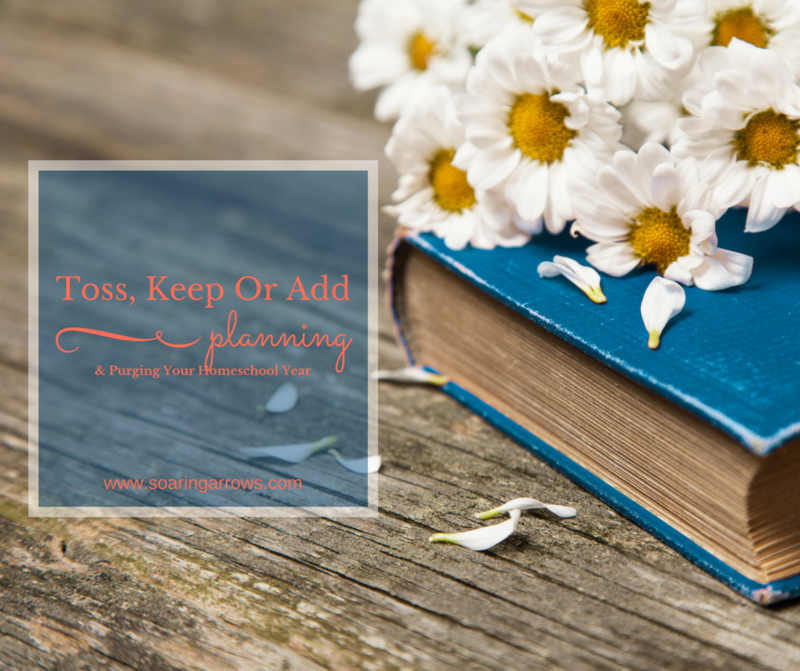 Plan what will add life and purpose to your homeschool. Great suggestions to stay focused! Thanks for sharing – perfect timing as we begin to plan next year!